It takes about 15 minutes drive from the Ibadan end of Lagos/Ibadan Expressway to get to Kakanfo Inn and Conference Centre, Ibadan. The luxury-class hotel, arguably one of the leading hotels in the South-West, is located 120km from Murtala Mohammed Airport, Lagos. The edifice is visible from the popular Liberty Stadium in the heart of Ibadan. Built in 1988 by a writer and pioneer Chief Executive Officer, Ogun-Osun River Basin Development Authority, Dr. Lekan Are, the hotel continues to grow in size just as it seeks to maintain its ‘home away from home’ image. According to the Chief Executive Officer, Kakanfo Inn and Conference Centre, Mr. Damola Are, the recent efforts at renovating the hotel was borne out of the increasing need to meet the expectations of diverse range of customers. Are, who resumed duty in the hotels on November 1, 2012, added, “We decided to work extensively on the rooms, bathrooms and the pool bar. We converted the snacks bar into a mini room. Initially our bathrooms were not aesthetically appealing but all that has changed now with the transformation of the hotel. He said the hotel, which was opened on August 10, 1988 with 40 rooms added additional 40 rooms 10 years after. According to him, the opening of Kakanfo Conference Centre in 2010 further increased activities in the hotel. The conference centre has various halls with range of 200, 1,800 and 2,500 sitting capacities. The hotel has a standard kitchen in the basement and an expansive parking space. Asked about the challenges encountered in the course of renovation, he said, “The exercise affected our customers and business generally. There used to be a lot of banging, movements and packing of cables which have now been put in a conduit pipe. When you bang and chisel there will be a lot of noise, so we had to do it floor by floor and it took a lot of time as well as planning. “ We are adding additional suites so as to increase our room capacity. The renovation, apart from adding to the aesthetics, gives room for more space. This was intended to make the rooms more appealing and easier for our staff to clean up. It invariably helps to increase productivity. Are said the time frame to recoup the money spent on renovation was maximum of 24 months or less, while adding that patronage had improved in the hotel by 17 per cent. “At the hotel we used to have between 120 and 250 visitors per week. It has increased to 370 after renovation,” he added. 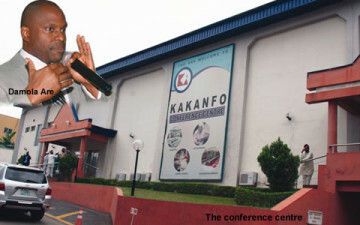 He put patronage at Kakanfo Conference Centre at average of seven events per week. He said, “Our goal is to further upgrade the security system through increased monitoring. We have about 22 cameras that are strategically placed at the moment. We have trained our workers in line with set standard considering the high profile of our guests. In this place, cleanliness and security are done by everybody.